The training path for engineers focuses intensely on scientific and technical knowledge. Yet, our professional and personal satisfaction and success also depend on other traits that make us more effective and productive. 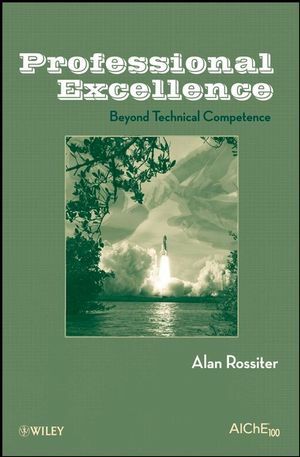 In this thought-provoking book, Alan Rossiter provides practical guidance in developing the skills to become more effective in your work, while also balancing your life. It is invaluable reading for graduating college students and young professionals as well as seasoned practitioners who find that work is becoming all-consuming. Alan Rossiter, PHD, is President of Rossiter & Associates, an industrial process improvement consulting company working primarily in the field of energy efficiency. In addition to consulting projects for companies such as ExxonMobil, ConocoPhillips, and BP, he provides training courses in pinch analysis and energy management. He also runs a separate series of courses in communication skills, engineering ethics, and professional excellence. Dr. Rossiter has more than twenty-five years of process engineering and management experience, and authored more than fifty publications, including numerous book chapters and refereed journal articles. He is a chartered engineer, a registered professional engineer (Texas), and a member of the American Institute of Chemical Engineers and the Institution of Chemical Engineers (UK).